A so-called "supermoon" occurs when a full moon coincides with a lunar perigee – the closest approach of the Moon in its elliptical orbit around Earth. Such events produce the largest apparent size of the lunar disk as seen from Earth, making it appear 15% larger and 30% brighter than during apogee (its most distant point from Earth). This provides great opportunities for astronomers and photographers. 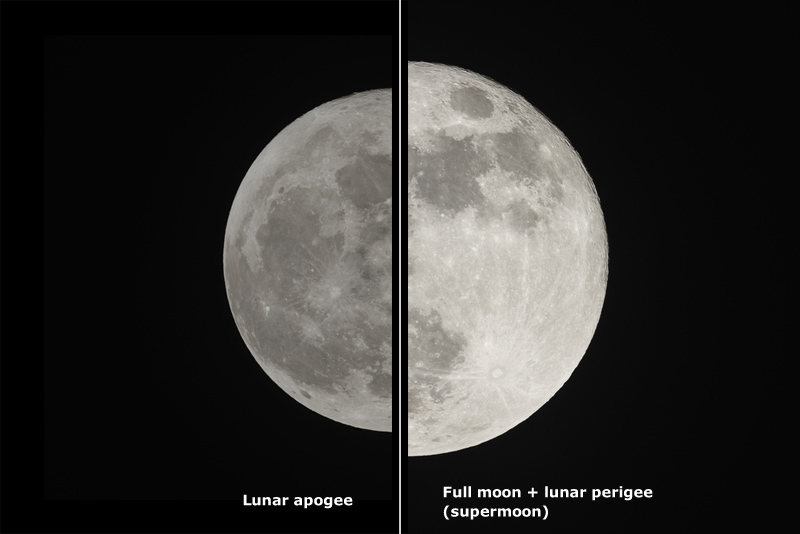 Particularly dramatic supermoons occur when a full moon and lunar perigee also happen when Earth is at perihelion (its closest point to the Sun for the year). On the morning of 14th November 2016, the distance between the centre of the Moon and Earth was 221,524 miles (356,509 km), the closest they had been together during a full moon since 1948. The Moon would not appear this large again until 25th November 2034. The closest supermoon of the century occurs on 6th December 2052. * Notable supermoons are also observed in 2070, 2088 and 2098.